7.2.1927 - 8.4.2019 Slipped away peacefully to be with his Lord and Saviour. Loved by all who met this generous soul. His loving children, Patricia, Paul, Anne and Phillip, 9 grandchildren and 3 great grandchildren. 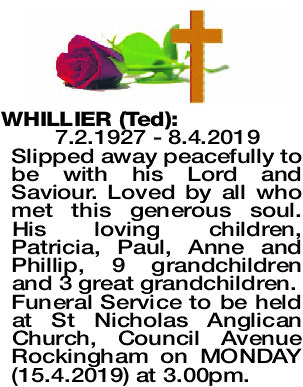 Funeral Service to be held at St Nicholas Anglican Church, Council Avenue Rockingham on MONDAY (15.4.2019) at 3.00pm. 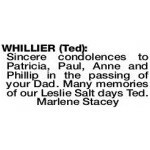 Sincere condolences to Patricia, Paul, Anne and Phillip in the passing of your Dad. Many memories of our Leslie Salt days Ted.